Despite all the attention I give my skin, sometimes I get breakouts. This post contains affiliate links. They will be marked with a *. Maybe I’ve been eating terribly for a couple of weeks (hello Christmas). Perhaps I’ve had a stressful time at work (never again, 2018). Or maybe my skin has just decided to rebel (this is why we can’t have nice things). No matter the reason, sometimes I need to take a step back when it comes to skincare. My usual routine contains actives – BHA, Retinols and Vitamin C and I love a good face mask. Every so often I’ll also use a physical exfoliator. But when I’m having a breakout, I have to take my skincare routine waaaay back to the simplest of products, otherwise I’ve found my skin is unhappier for a lot longer. So many times I just pulled back on a couple of things and then wondered why my skin was still bad a couple of weeks later. It was only earlier this year that I literally took out everything that might be a little iffy from my routine for two to three weeks that I have seen my skin the clearest it’s been in a long time. From there, I then reintroduced things back into my routine slowly, just like when I first started my skincare journey. Even now, I’m not back on retinols and I don’t think I’m ever going back to BHA. Every ‘simple’ routine will differ from person to person. 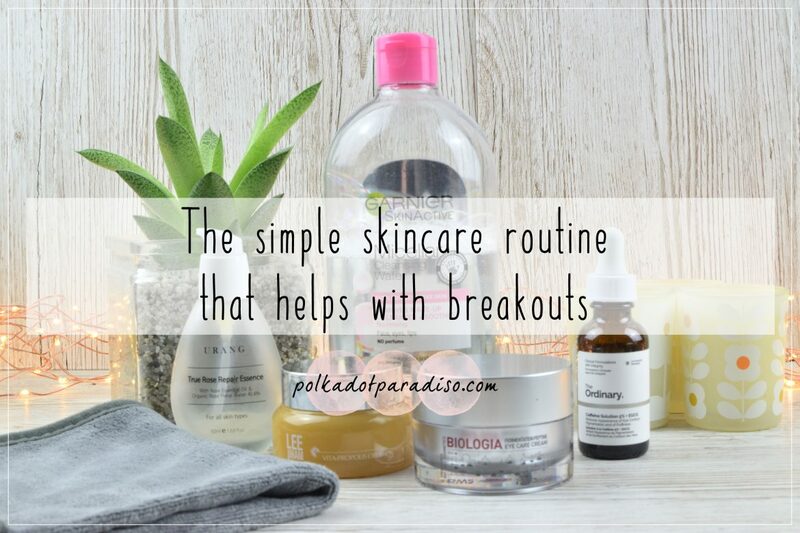 I’m going to take you through my pared back routine for breakout and sensitive skin times. There may be products mentioned below that don’t agree with you, and that’s fine. You may also find you don’t need to be as radical as me in terms of taking things out of your routine. Hopefully though, for those of who do struggle, or are struggling with a particularly bad breakout right now, this will help decide on how to help your skin. Sometimes adding more products to fight a breakout isn’t always the best course of action. For each step, I’ll take through what I use and why, and also mention what in my ‘usual’ routine has been cut. I’ve spoken about my approach to cleansing before in that I keep it simple. I find a lot of cleansers just irritate my skin and the less splashing my face, the better. To remove my make up at the end of the day I use either a make up eraser or just a microfibre cloth. I then follow it up with cleansing water. I find the combo does a great job of getting rid of make up and doesn’t leave my skin feeling dry or tight. On a morning, I’ll just use the cleansing water and nothing else. Understandably, I’ll cut out the physical exfoliator during bad skin times. The Tosowoong Enzyme Powder Cleanser is one of my favourites but definitely too harsh for me when I’m having a breakout. Removed – Urang Rose Mist in the AM and Klairs Unscented Toner in the PM. Unpopular opinion here but I don’t tend to use a toner unless I’m using actives so when it comes to a simple routine, the toner gets booted. Sometimes I will use the Urang Rose Mist on a morning, particularly when I want to feel a bit more fresh and awake but generally I go toner-free. I should probably pick up a hydrating toner for days like that. If you have any great recommendations, let me know in the comments! The Ordinary Caffeine Solution* & Biologia Eye Care Cream. These don’t change if I’m having a break out and these two are what I’m currently using – reviews on their way! As already mentioned, I avoid all acids/actives during bad skin weeks. My skin has to be in really good shape for me to think about reintroducing any. Urang True Rose Repair Essence. This stuff has been a bit of a saviour during my bad skin times. It’s soothing, calming and cooling on the skin. My essence doesn’t change according to whether I’m having a breakout although when I run out of this I’m looking to keep some in to switch in to the next time I do have one. It’s been that calming on my skin I can’t imagine not using it next time I have a flare up. Lee Jiham Vita Propolis Cream. This is my current daily moisturiser after finishing the Urang Rose Ceramide Cream and I’m really loving it. For ages I thought anything related to honey wasn’t good for my skin but this has been fantastic. It leaves my skin feeling plump and smooth and make up plays nicely on top of it. The slight scent is also really nice and not overpowering at all. Removed – any clay mask. I’m all about the hydration when my skin is bad and my week of sheet masking really opened my eyes to the benefits it can have on your skin. This will be all I’ll use until my skin is looking in better shape. I love clay masks but these get cut. While they are generally supposed to be for acne prone and angry skin I find that if my skin is in a bad way, it doesn’t react well to clay. I find clay masks are much better as a preventative measure for me. When to get back to your old routine. This will depend on your skin really. I was on a scaled back routine for almost a month before I started reintroducing things. I started first with Vitamin C (because that stuff is amazing for my PIE) and the toner to go with it. Then I moved onto adding some new products into my routine – the Urang Clarifying Mask and Klairs Vitamin E overnight mask. After about three weeks (adding one new product in a week) I’m now at the point where I’m about to add a retinol back in, starting with once a week. I do have a new cleanser from Skinsider to try so I’ll start that the following week. I haven’t used the Tosowoong exfoliator yet, largely because I haven’t felt like I needed to. It’s been nice to have a shorter skincare regime lately. Aside from the extra time saved each morning and night it’s allowed me to really appreciate and evaluate the products that I’m using better. When you discover new products and brands it’s really easy to get caught up and just start using everything. And if you skin doesn’t like one of them then good luck working out which one it is. Even if you’re not having a breakout in particular, but you’re finding that your skincare just isn’t working how you thought it would, I highly recommend pulling it back for a while. Putting a few less products on your face for a bit won’t do you any harm and you may even find your skin benefits from it!